Watching price action in the consumer sector can tell us a lot about the underlying environment for stocks, in general. Introducing a quantitative system that invests in stocks or Treasury bonds based on the relative performance of consumer discretionary versus consumer staples stocks. The quantitative strategy does a solid job at increasing returns and controlling downside risk over the long term. No quantitative system can be infallible, and investment decisions should never be based on one single indicator. 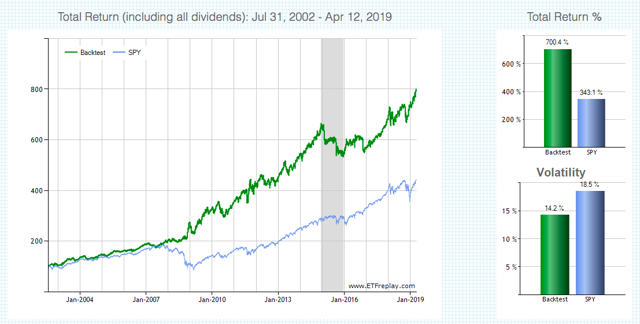 However, the relative performance of consumer staples versus consumer discretionary is sending a bullish signal for stocks, and this is a relevant piece of evidence that should be acknowledged. Markets are unpredictable, meaning that nobody can consistently predict what the market will do next. However, some quantitative metrics can be remarkably effective at evaluating risk appetite in the stock market and managing positions accordingly. The consumer sector is a critical driver for the economy and the markets, so watching the price performance of consumer discretionary versus consumer staples stocks can say a lot about the main trends in risk appetite among investors. When discussing the consumer sector, the distinction between consumer discretionary and consumer staples is of utmost importance. In simple terms, discretionary products and services are considered non-essential, but desirable when consumers have enough extra money to pay for them. As a reference, the table below shows the top 10 holdings in Consumer Discretionary Select Sector SPDR ETF (XLY). In stark contrast, the consumer staples sector is mostly focused on essential items such as food, beverages, tobacco, and household products. Most people are unable or unwilling to reduce spending on consumer staples sectors, even under tough economic conditions. Looking at the top 10 holdings in Consumer Staples Select Sector SPDR ETF (XLP), it's easy to see how the two ETFs are very different in their composition. When risk appetite is rising and investors expect the economy to remain strong, chances are that the consumer discretionary sector will deliver bigger gains than the consumer staples sector. Conversely, when investors are getting pessimistic and risk appetite is declining, seeking refuge from market volatility by investing in consumer staples stocks looks like a much sounder idea. The following quantitative system basically reads the signals from consumer discretionary and consumer staples in order to make decisions in the stock market based on how risk appetite is evolving. The main idea is having a data-driven tool to measure how risk appetite is being reflected in different sectors and manage risk exposure accordingly. The system is based on a ratio that measures the relative performance of Consumer Discretionary Select Sector SPDR ETF versus Consumer Staples Select Sector SPDR ETF. When this ratio is rising, it means that consumer discretionary stocks are outperforming consumer staples stocks, so risk appetite is increasing among market participants. Conversely, when the ratio is declining, this means that money is flowing away from risky stocks and towards safer alternatives in the consumer space. When the consumers versus staples ratio is above the 100-day moving average, meaning that risk appetite is rising, the system is invested in SPDR S&P 500 (SPY). 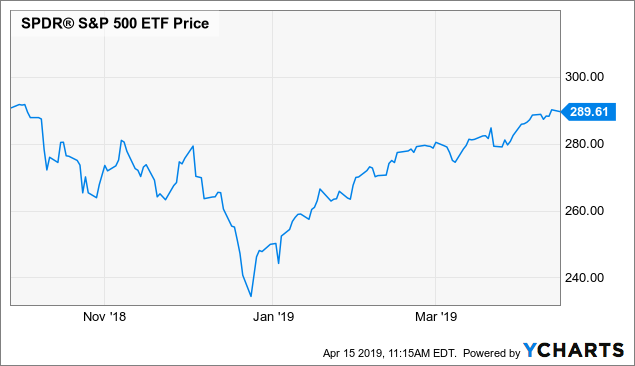 Conversely, when the ratio is below the 100-day moving average, the system buys iShares 20+ Year Treasury Bond ETF (TLT) for portfolio protection. The chart shows the backtested performance statistics for the quantitative strategy versus a buy and hold position in SPDR S&P 500. Not only has the strategy produced superior returns but also much smaller drawdowns. The backtesting starts on July 31, 2002, because that is the first full month in which all of the ETFs are available for trading. Since then, the quantitative strategy has gained 700.4%, more than double the 343.1% produced by a buy and hold position on SPDR S&P 500. 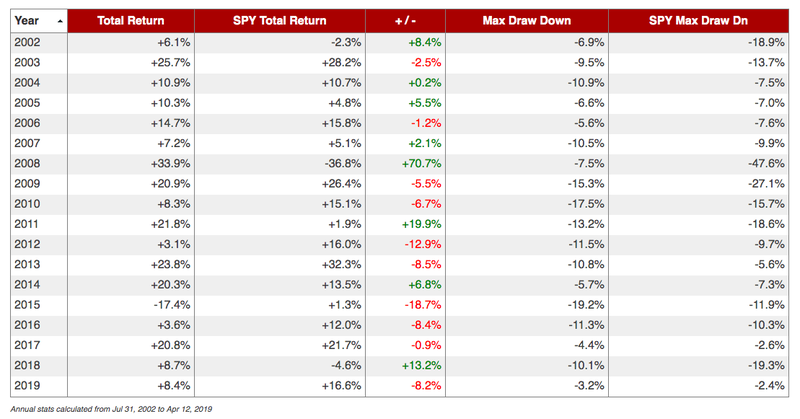 Perhaps more important, the quantitative strategy has a maximum drawdown - meaning maximum capital loss over the period - of 19.9% versus a much larger drawdown of 55.2% for buy and hold investors in SPDR S&P 500 over the backtesting period. In other words, the strategy is not only effective in terms of increasing returns, but the main benefit is that it does a great job in terms of risk reduction. If we look at the annual performance statistics, we can clearly see that the quantitative strategy is far from perfect or infallible. In 2015, for example, the strategy had a particularly rough year, since it had some false signals in the first quarter of the year, rotating in and out of stock at the wrong time. On the other hand, a strategy such as this one can make a huge difference in a deep bear market such as 2008. While the SPDR S&P 500 lost 36.8%, the quantitative strategy actually gained 33.9% during the financial crisis in 2008 by protecting the portfolio in February of 2007. In fact, from March of 2007 until March of 2009, the strategy was entirely allocated to Treasury bonds as opposed to stocks, which was a great signal in retrospect. 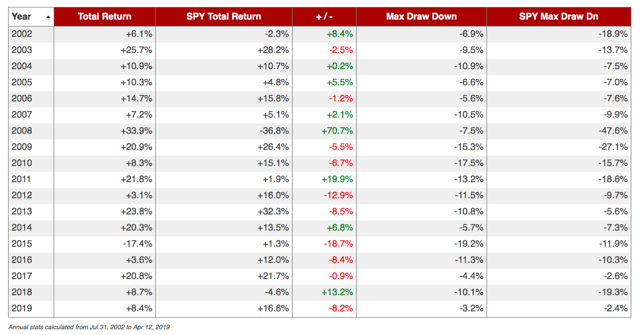 More recently, the strategy sold stocks at the end of October of 2018, and it went back into stocks at the end of January in 2019. 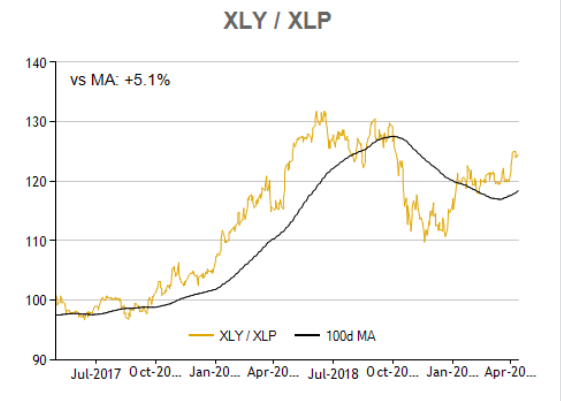 This means that the strategy missed some of the gains in January, but it did a solid job in terms of protecting investor capital in the fourth quarter of 2018 and capturing a large share of the rally in early 2019. These kinds of quantitative strategies have both their weaknesses and strengths. They tend to perform well in the long term, but they also produce false signals from time to time, especially when the markets are moving sideways, and the main trends in risk appetite are weak and short-lived. But the main point is not making investment decisions based on one single indicator or strategy. We need to have multiple tools and indicators to evaluate market conditions, and then we make investment decisions by weighing the evidence from those indicators. In any case, an investment approach supported by hard data and statistical evidence is clearly superior to one based entirely on subjective opinions and speculation. The consumer discretionary versus consumer staples ratio is currently sending a bullish signal for stocks, and this is a relevant piece of evidence that deserves to be acknowledged. Disclosure: I am/we are long AMZN. I wrote this article myself, and it expresses my own opinions. I am not receiving compensation for it (other than from Seeking Alpha). I have no business relationship with any company whose stock is mentioned in this article.